"Being at peace with one another"
Each September for the last nineteen years, hundreds of scientists and astronomers find their way to Maui for the annual Advanced Maui Optical and Space Surveillance Technologies Conference that is held in Wailea. This year’s conference opened on Wednesday, September 12, 2018 with over 800 participants from over 20 countries. The conference began almost two decades ago out of a shared interest by scientists and astronomers on how best to track over 500,000 pieces of debris or “space junk” that now orbit the earth at speeds up to 17,500 mph. At that speed, a relatively small piece of orbital debris can easily damage a satellite or space craft (Ref. : nasa.gov). According to NASA (National Aeronautics and Space Administration), the growing amount of debris increased the potential danger to all space vehicles, especially to the International Space Station, space shuttles and other spacecraft with humans aboard. So it is in the interest of those attending the conference that includes members of the U.S. Air Force to work together cooperatively in making certain that they are able to at least track objects that are larger than a softball. While the tracking of the debris is critical, the technologies that have been developed have also provided us with a system of global communications and with the ability to track the global changes in our climate. Each year, I have had the opportunity to offer the blessing for the opening of the four-day event. 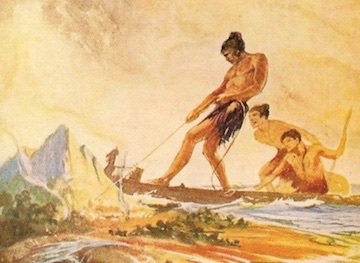 Maui remains a part of the mythic tradition of many of the cultures of Polynesia. His name is familiar. Here in Hawaiʻi we remember how Maui lassoed the sun and slowed its journey across the sky each day. He did not do it for his own benefit or for any desire to call attention to himself. He did it so that there would be enough time in the day for the kalo or taro to be planted and harvested; so that the kapa or bark cloth to be made. What Maui did, he did for the benefit of the people. He harnessed the energy of the sun for a day’s work. There are no lassoes today but there are telescopes atop Haleakalā that are a part of the space surveillance system. My word of encouragement to those who attend the conference each year is that, like Maui, they will also do their work for the benefit of people. There is a move afoot within the U.S. government to “militarize” space not simply for the purpose of defense but for the “prosecution of war.” That, in my opinion, would be something even a warrior like Maui, would find objectionable. The first time I shared the story of Maui, one of the participants took it upon himself to come down to Mākena at the close of the conference to express his concern that, as a Christian, my comments about the story of Maui would lead “young, baby Christians astray.” He made clear that he was, himself, a believer and a devout Christian. I thanked him for expressing his concern. I, then, responded to his concern by saying that whether or not anyone believes the story of Maui is literally true, what is important is that the story teaches us a truth - that our care for the land, the air and the skies ought to be of benefit to all of humankind. It may be that he was distressed because there is power in myth. In 1988, Joseph Campbell’s The Power of Myth was released and became one of the most popular television series in the history of public television. Campbell and television journalist Bill Moyers began their groundbreaking and timeless conversation with an exploration of the classic hero cycle, including consistent and enduring hero patterns in literature, real life and in the mythic stories of cultures around the world (Ref. : billmoyers.com). The concern raised by the man who came by at the close of the AMOS conference reminded me of our reading for this morning that comes to us from The Gospel According to Mark. “We hear Jesus teaching the disciples not to be too exclusive” and “to be attentive to the weaker members of the community” (Preaching Through the Christian Year B, Craddock, Hayes, Holladay & Tucker, Trinity International Press, Harrisburg, Pennsylvania, 1993, page 420). Was Jesus overstating the case when he said insisted that it would be better to put a millstone around one’s neck and be thrown into the sea than to put a stumbling block in front of “baby Christians”? Was he being hyperbolic in insisting that if one’s right hand caused one to stumble, to cut it off or if a foot caused one to stumble, to cut it off or if one’s eyes caused one stumble to tear it out? I remember seeing a movie while I was a child of a character’s shadow on a wall. The music accompanying the scene was ominous. Even though it was a silhouette on a wall, it was a horrific scene in which the character plunged a wooden stake into his eye. Well, all I can say is as a result of that scene, I have never held our verses 42 to 48 in a warm place in my heart. But Jesus response to John’s protestation is perhaps the key lesson for us this morning. “Can you hear them? Jesus? They say. He ignores them, because he knows what’s coming. Jesus, a little louder and more insistent. Then, Jesus! He turns to them impatiently, and they intone with that know-it-all edge, Jesus! Those people over there, you know the ones we don’t know? Well, they are healing and casting out demons, but not the way we do it. Make them stop before they ruin everything!” (“Living the Word,ʻ Christian Century, Rachael Keefe, September 12, 2018, page 18). Keefe goes on to say, “Like many who are certain of their right(eous)ness, the disciples are likely shocked when Jesus doesn’t immediately take their side” (Op. cit.). John and the others need to be right in their judgment. But Jesus essentially tells John and the other disciples not to worry about what others are doing – especially when they are doing nothing against Jesus. “Whoever is not against us is for us. For truly I tell you, whoever gives you a cup of water to drink because you bear the name of Christ will by no means lose the reward” (Mark 9:41). The lesson is to be found in at least four areas of instruction. First, “not being one of us” is not an adequate criterion for determining that a person is not a Christian. To be sure, such a determination was a problem in the early church. But not being in the circle was no ground for exclusion (Preaching Through the Christian Year B, Craddock, Hayes, Holladay & Tucker, Trinity International Press, Harrisburg, Pennsylvania, 1993, page 427). Second, the practice of hoʻokipa or hospitality, even a cup of cold water given and received was not an act to go unnoticed or unrewarded (Mark 9:41). Third, it was important that new believers – “baby Christians” – be given special care and consideration (Mark 9:42). Fourth and finally, the life of a disciple must be morally earnest. Our present behavior, Mark cautions, has eternal consequences (Mark 9:43-50). Pastor Keefe points out, “Jesus has shown us the way to embody love, to create relationships that are the foundation for the realm of God. Perhaps the time has come to show the world what kind of Christians we are rather than proclaim what we are not” (“Living the Word,” Christian Century, Rachael Keefe, September 12, 2018, page 18).